Look at your garden, do you think that something is lacking? 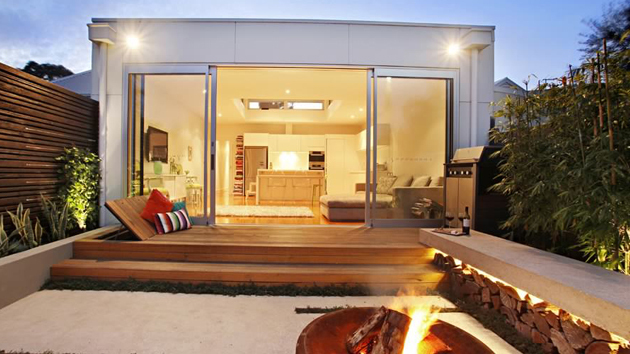 You might want to place a structure like a gazebo or a pergola but your space is not enough to accommodate it. So, if you are thinking of ways to ad beauty to your garden, you can try getting a garden bridge. But of course, you have to work on the plants and flowers that will go with it. 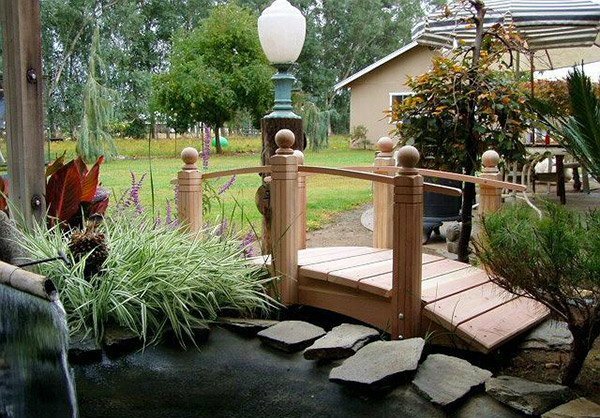 Garden bridges come in different designs and are made from various materials. 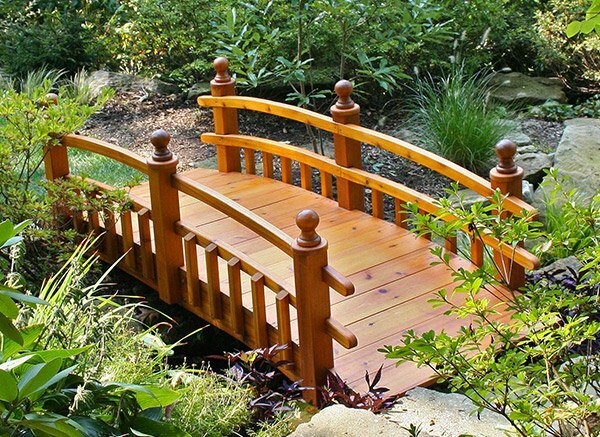 For today’s post, we will give you wooden garden bridges. You will be able to see how each design can depict a modern or traditional impression to the gardens that would match the kind of architecture and interior design you have. 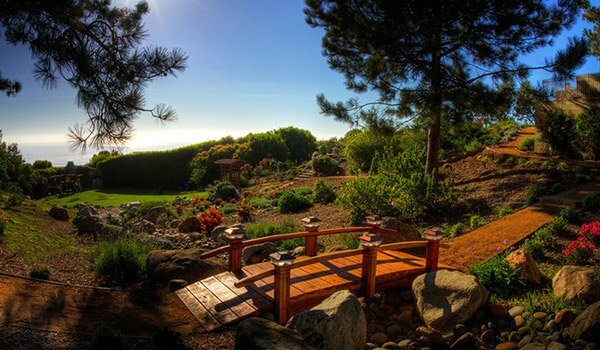 So, scroll down and look into 15 wooden garden bridges that could add a whimsical touch to your garden and could fill in the lacking beauty in it. Imagine this space minus the bridge. It looks dull isn’t it? 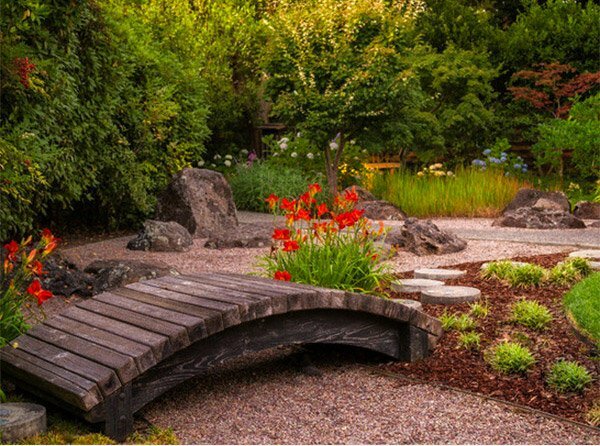 But with this simple curved wooden bridge, the entire garden looked beautiful. 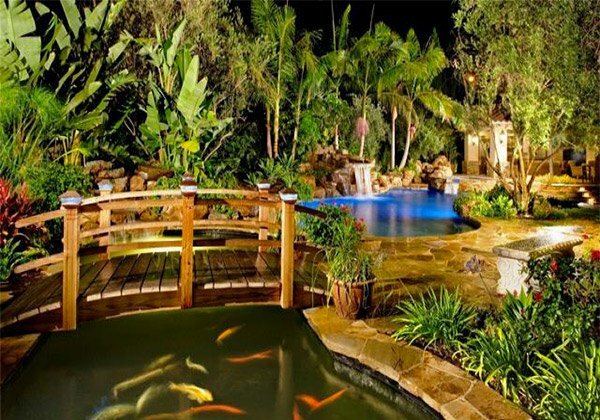 A paradise that any homeowner would like to have. The trees and bushes around it create a very nice scenario plus this single rail bridge. 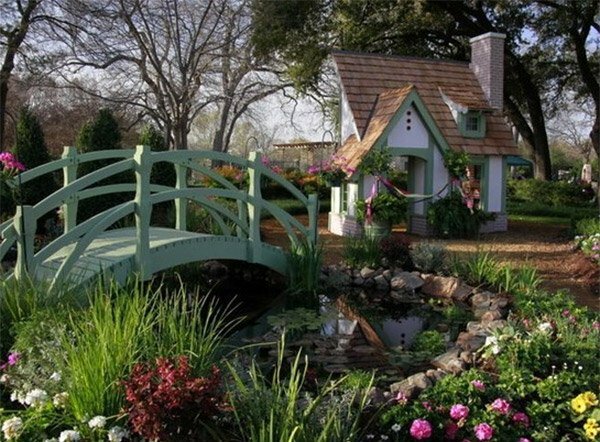 The cottage itself is whimsical but the addition of this bridge and pond made the garden look like a storybook scenario. Double rails bridge that is beautifully and sturdily designed. Look at how perfect its finish is. A modern home deserves a modern wooden bridge like this. 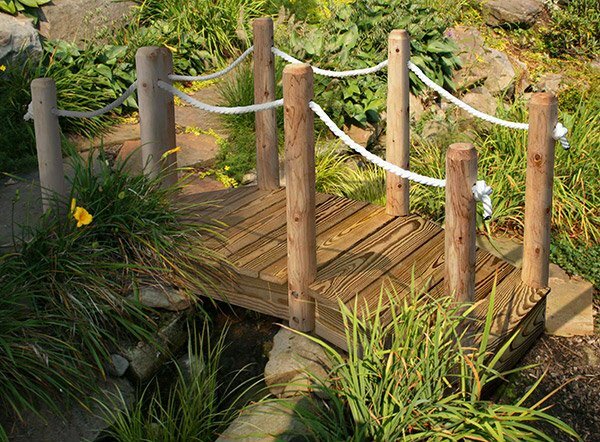 An exquisite wooden bridge with ropes which could make you look back to the ancient bridge designs. It’s not just the bridge that made this beautiful but the landscape of flowers and the pond under it made the difference. A koi pond is already awesome on its own but with the addition of this bridge, the garden looked a lot gorgeous and also made it possible to access the other side of the pond. Another modern bridge with recessed lighting under it. This will certainly create a dashing night garden scene. 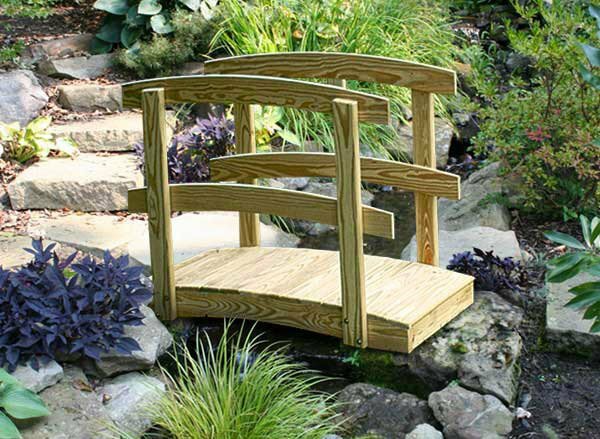 A Japanese inspired foot bridge made from treated pine. 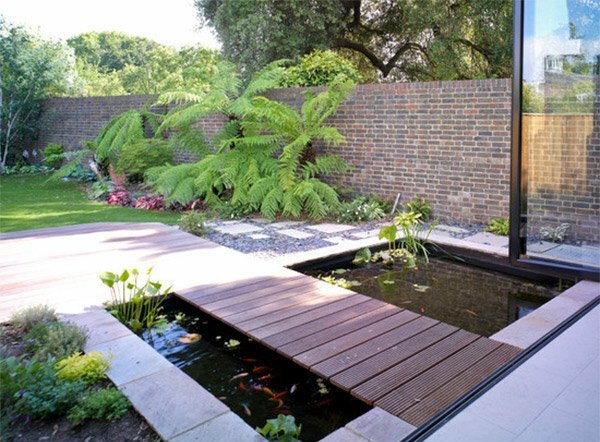 This 2′ wide bridge is simple yet it gave the garden a totally appealing look. Well, it’s just that. A low wooden garden bridge but look at how huge its impact is in the entire garden. 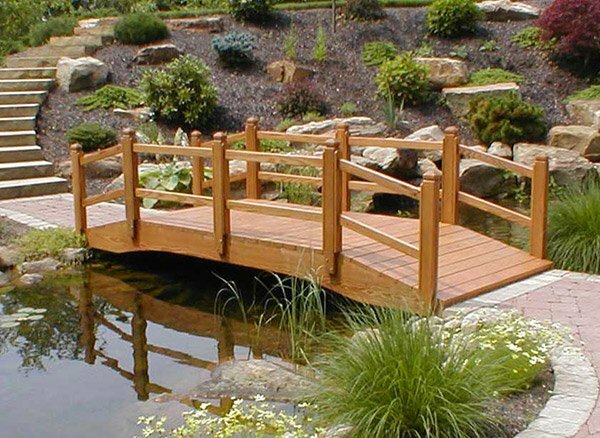 Traditional bridge design with double rails to make passage possible for those who visit this garden. Just pretty with its round top for the balusters and the detailing is also good. 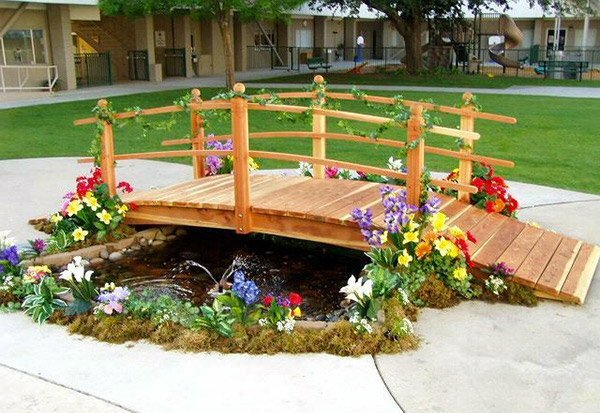 A simple garden bridge which you can make by yourself and add it to your very own yard. 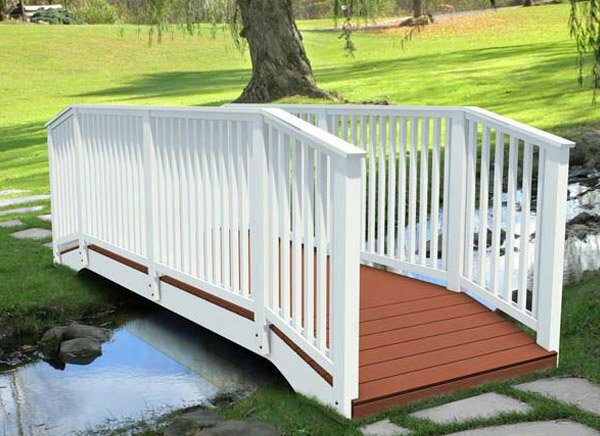 A white bridge made from pine wood in its traditional look. 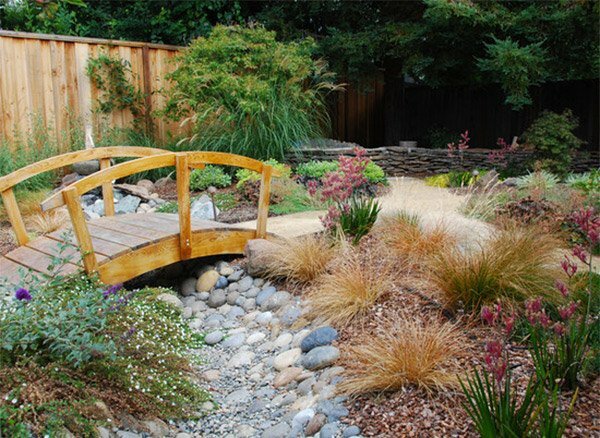 It is indeed amazing that these bridges can create a huge difference to one’s garden when we speak of aesthetics. 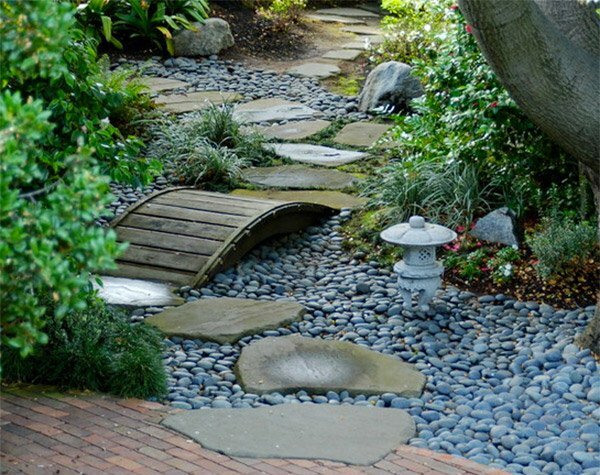 These may not be that large but you can see that it can help you enhance your garden’s look as well as providing a pathway to reach to another end especially if there is a body of water. 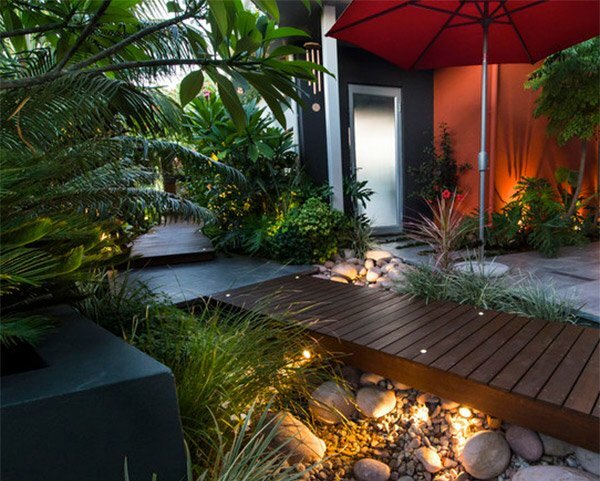 So, that’s all for today, look forward for more landscape design inspiration here in Home Design Lover. As you can see from my info above, I am Stan Tinsley. I am the General Maintenance Coordinator for our ministry headquarters in New Knoxville, Ohio. We have a footbridge on our property that we are going to replace. Your Double Rail Pedestrian Bridge is very similar to the bridge we have on our property. Our bridges spans a creek that floods a couple times a year. For that reason, it is elevated about 6 1/2 feet above the top of the concrete footings. It spans a distance of 60 feet and is 5 feet wide. Can you give me an idea of what a 60 foot version of your bridge will cost? Thank you.